You probably haven’t been able to avoid bitcoin, blockchain, cryptocurrency, and ICO hype in 2018. If you have, kudos, kudos, but my social media newsfeeds are buzzing with messages from crypto-heads … and my email … let’s just say it’s spam central. That said, the blockchain revolution is booming, putting FinTech at the forefront of Wall Street, Silicon Valley, and Capitol Hill discussions.Startups are devouring venture money and carving space in an ecosystem that just a few years ago was dominated by big banks deemed too big to fail. Last week, Robinhood raised $350 million on a $5.6 billion valuation, up from $1.3 billion just one year prior. Banks are beginning to realize that these startups are here to stay and they’re finding unique ways to collaborate. Goldman Sachs backed startup Circle bought a major crypto exchange called Poloniex, while Barclays announced a partnership with Coinbase. All the while, regulators in the United States have held hearings on Capitol Hill and cracked down on ICOs. The blockchain revolution is adding fuel to the FinTech fire. Blockchain has the potential to make things faster, cheaper, easier, safer, more transparent… and all of that means a better customer experience that people will love. Money is being siphoned into the space fast and we’re here to help you better understand where it is all going. 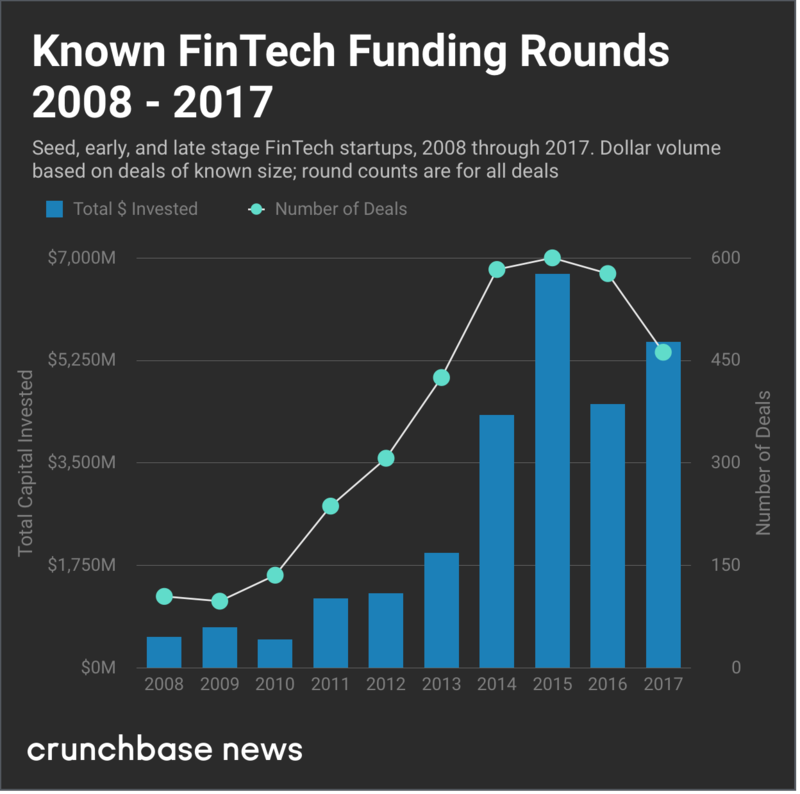 According to Crunchbase, $28 billion has been invested in FinTech in the last ten years. Of that, $7 billion (25%) has been invested in the last twelve months alone. There are a variety of startups drawing the attention of investors and venture capitalists in spaces like insurance, banking, investing, blockchain, lending, and more. Founders like Sallie Krawcheck are leveraging technology to transform the way women think about their money. Sallie launched Ellevest in 2014 to redefine the way women invest their hard earned dough. In 2017, Ellevest raised $34.6M in a Series A round that was led by Rethink Impact. Discover more about Ellevest in an article we published back in December. Read now. Varo is a personal mobile banking application that wants to end traditional banking. It provides fee-free checking accounts, savings accounts, and personal loans, while allowing its users to balance spending and income factors. The company was founded in 2015 and just raised a $45 million Series B in January 2018 led by Warburg Pincus and impact investment firm The Rise Fund. In 2017, Coinbase fueled its massive growth with a Series D round valued at over $100 million led by institutional Venture Partners. According to Coinbase, they’re building the easiest way to buy and sell digital currency. They’ve reaised over $225 million to date and are sitting at a juicy $1.6 billion valuation with no end in sight. Here are some other rising players in FinTech according to Crunchbase. 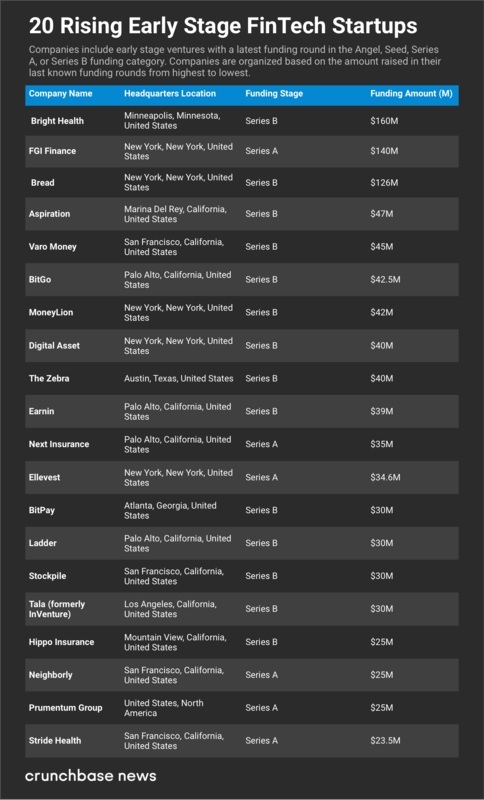 This list represents 20 seed and early stage US-based startups that have raised considerable cash since January 2017. More money was raised via ICOs, a route which many FinTech and Blockchain companies are exploring en lieu of, or in addition to, traditional fundraising. In 2017 alone, over $5.6 billion was raised across 435 projects, representing $12.7 million on average per project. FinTech projects Status, TenX, and Salt raised $108 million, $80 million, and $48 million respectively according to Business Insider. Stay tuned for more FinTech news on FinTech Nation. Previous Previous post: When Is The Right Time To Pursue Your Passion?